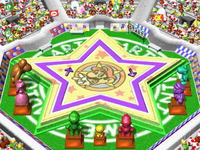 The Mini-Game Stadium is a game mode in Mario Party and Mario Party 2. In Mario Party, it is inside the Pot O'Skills within the Mini-Game House. Players take turns moving around the board with 29 spaces, but unlike regular boards, there are no Stars, with winners and losers determined by the number of coins they have collected by the end of the game. The board is yellow with a picture of Mario's face at the center. It is star-shaped with only blue spaces along the sides and red spaces at the tips. The stadium itself is an open-air, concrete octagonal structure with a single deck filled with various Mario characters as fans. The grounds surrounding the board have grass turf and statues of the six playable characters and Toad. A couple of Toads and Koopa Troopa look on from the sidelines as well. During gameplay, the players take turns hitting the Dice Block, moving around the board in a clockwise direction and landing on the spaces. However, landing on a Blue Space or Red Space does not result in the gaining or loss of coins; it simply acts as a determinant for the teams in the following minigame. When players pass the start at the top of the board, Koopa Troopa will give them a 10 coins. In Mario Party 2, it appears as an unlockable in Mini-Game Land. It is unlocked by buying at least three 4-Player, 2-vs-2, and 1-vs-3 mini-games. There are three sub-modes in the Mini-Game Stadium. Each is unlocked one after the other. Mini-Game Battle is the default mode and is a battle of mini-games. The player who wins three, five, or seven mini-games is the winner. Then Mini-Game Trial or Mini-Game Duel can be unlocked. Mini-Game Duel is unlocked when the first five duel minigames have been played. Mini-Game Trial is unlocked by playing a certain number of Mini-Game Battles. When all mini-games possible have been played - including those in the Mini-Game Stadium, the Mini-Game Coaster is unlocked. This page was last edited on March 10, 2018, at 01:06.